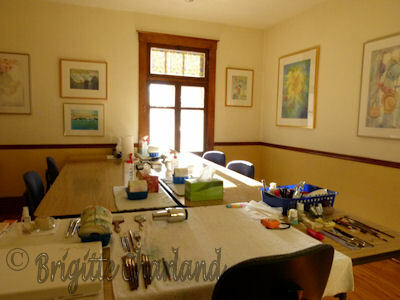 Caracteristics of Brigitte Charland's watercolor school. 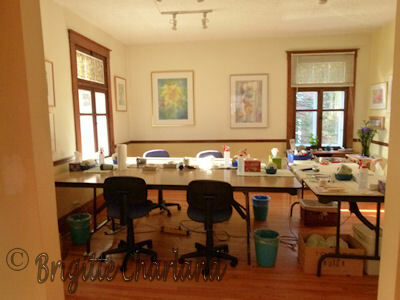 Since 1994, Ishe teach watercolor with a technical approach, assited by charts, colour photos, and step-by-step demonstrations. My classes are formulated to require no special skills in drawing, I provide the drawing inspired by my many photographs to start with. At every course, you will complete a small painting to practice many different techniques and color combinations. I provide you with a class note book full of informations of the class content. I will guide you in the discovery of watercolor's many applications, moods, and all while discovering your talent and style. and to get to know your tool, the brush. In the next levels, you will be able to evaluate and apply your knowledge of composition and perspective, accentuate the center of interest and mix an inventive coloration in your paintings. You will skillfuly create smooth or rough textures, warm and cool blends, light or dark hues to produce eye-catching art. Every exercice painting will make you practice the teacher's favorite techniques; wet-in-wet and negative painting through many layers. Those exercice paintings range from a field of daysies, a winter scene, fruits on lace, flowers in a vase, row boats docked, a child playing in the sand, to a women's portrait. There are three levels: basic techniques, Intermediate 1 and 2 and 3. These are given in 8 afternoons from 1 p.m. tru 4;30 p.m. in Automn, Winter and Spring. Since 2014, the Inter 3 session can include a concertration in either portrait or small animals included in landscape settings. From June tru September,you will find some intensive-workshops of 3 or 2 full days on a particular subject or technique. In the summer, spring and early fall, workshops are given in 2 or 3-days intensive-workshops from 9;30 a.m. to 4;30 p.m. on mondays tru wednesday. This is my veranda where we can take our brakes and lunch during the 3-day workshops. 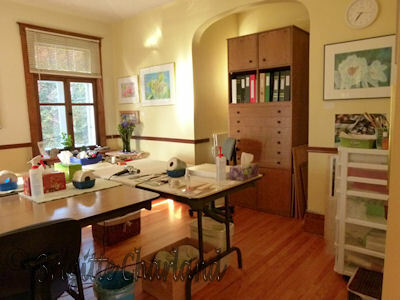 My atelier is well lit with two large windows and each of your places is also lite with a projector. 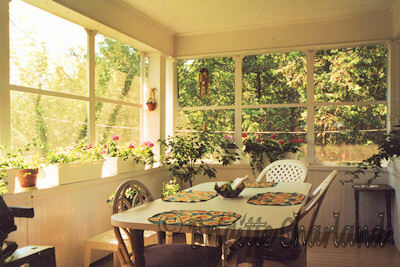 I keep a nice warmth in the winter with radiators, and is cooled in the summer if it is too hot to open the windows. I rent the whole second floor, there are no stairs in my appartment, the hall is spacious but not adapted to wheelchairs. Parking is in front on the other side and always free. my atelier is a smoke-free invironement, and eco-responsable but not adapted to wheelchairs or reduced mobility.